This document is different from the other rental papers. 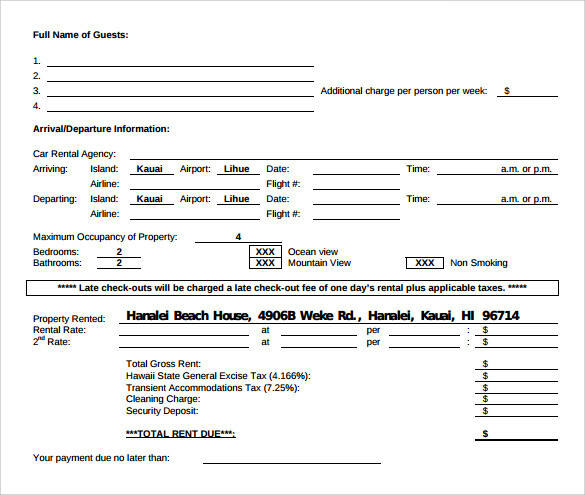 This document highlights that the particular property is rented out only on vacations. The property is rented out at specific times of the year and for a specific duration. 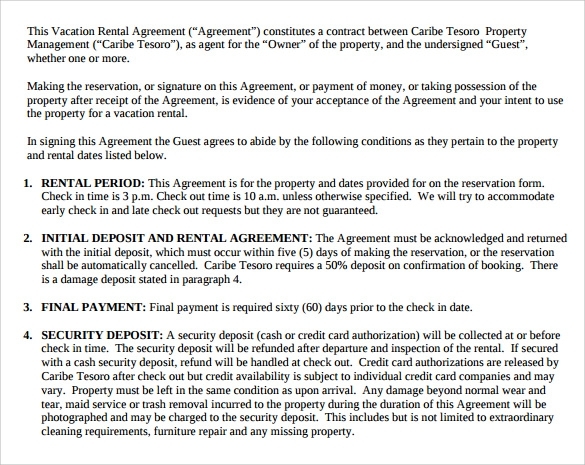 The Vacation Rental Agreements is signed by both the parties involved. The terms and conditions are clearly mentioned in the document along with the penalty clause, if any. 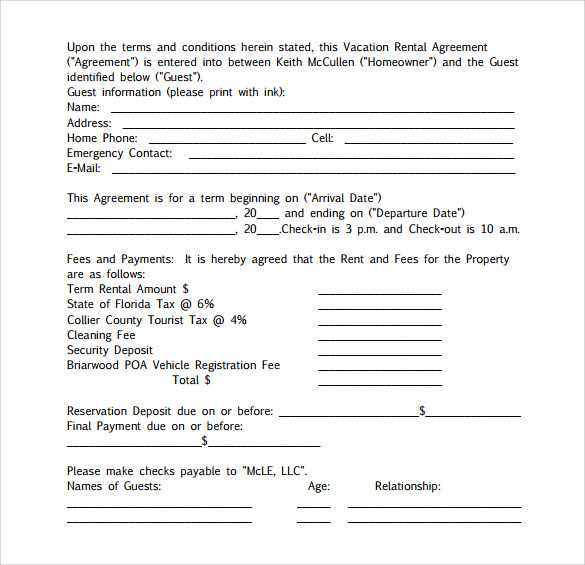 The sample Vacation Rental Agreement can be customized to suit the customer requirements and specifications. It comes in different designs and formats. Opt from pdf and word version. The document can be saved and printed later as well. While on a vacation renting any kind of non-liquid assists like a vacation home or a car must keep a vacation rental agreement which mentions all obligations between both parties. You can download a free template of this agreement in a word or pdf format from the internet. A vacation rental agreement is legal obligation contract between owner and renter while on a vacation. A sample document can be downloaded from the internet which contains a title, names, dates, and a subject with theclarity of all rental related issue. A sample is available in both pdf and word document. A vacation rental agreement is a legal contract between owner and leaseholder on renting car, houses etc. while on vacation. 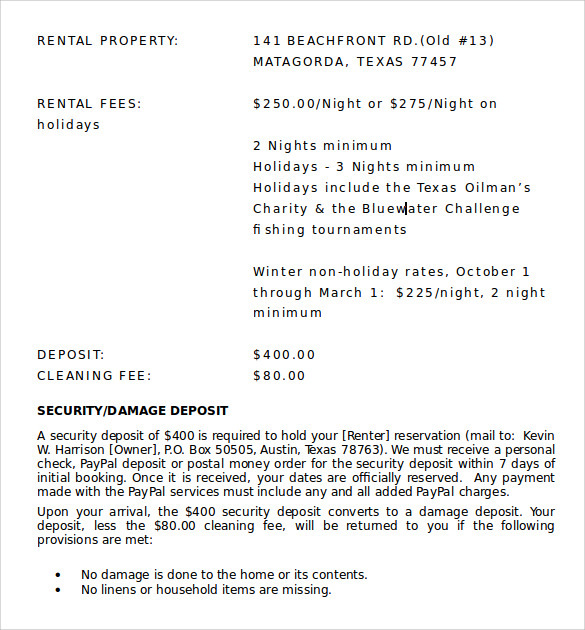 A standard vacation rental agreement is available on hundreds of website on the internet which can be downloaded as word document for customization or as a ready to print pdf file. 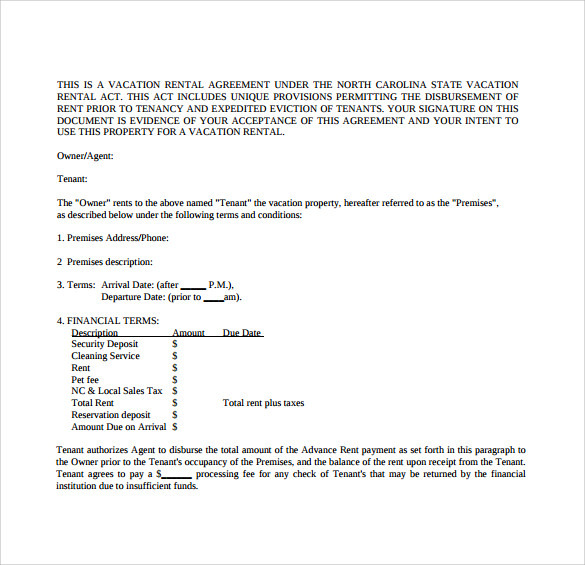 This vacation rental agreement template is a design that can help to create very definite papers. The template speaks of various terms and conditions that are to be followed in the agreement. This template is very easily available over internet. The user can download the template design in the form of word document. The theme is one that can be edited wit super ease and also immense speed. 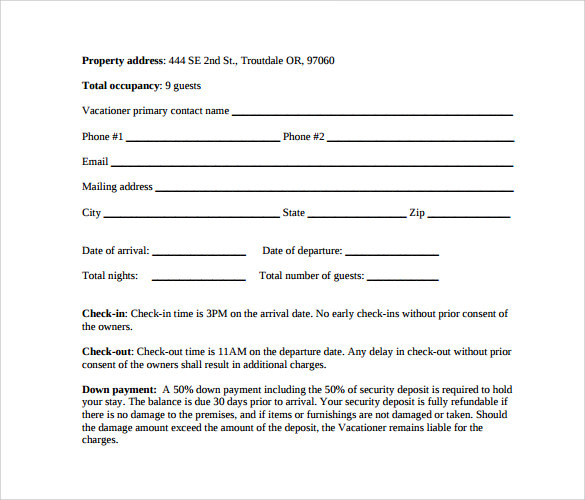 The template can support the information of the name of the guest who is to be accommodated. The time of the year when they are to be accommodated and also the terms and conditions of payments to be done by the guests. 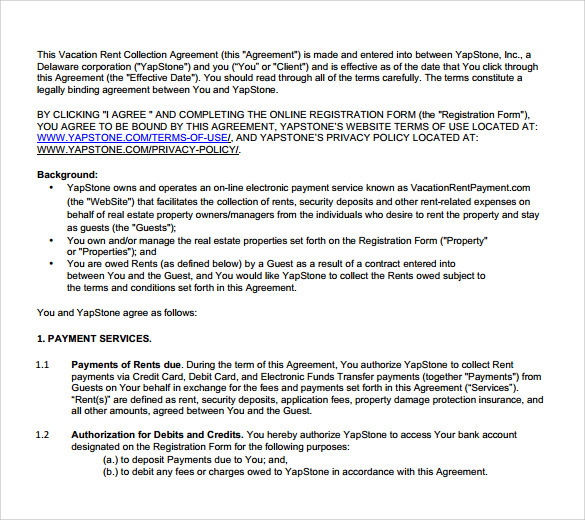 What are the Vacation Rental Agreement Templates? Vacation rental agreement templates are designs that have been professionally made so that the user can make documents which shall be ready for use and can be used to make documents that shall state that who can rent the property at what point of the year and for how long. You may like Home Rental Agreements. 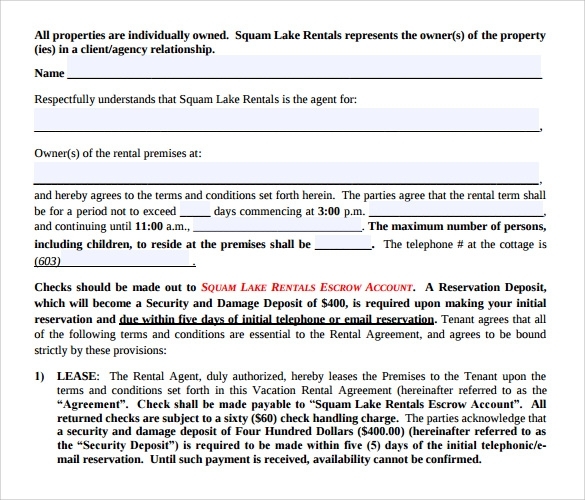 Who can use the Vacation Rental Agreement Templates? These Rental Agreements can be used by the landlord o the owner of the property who is leasing or renting out the property. At the same time the tenants who shall be taking the property on rent are the people who can also make a proper use of the template and can make documents that can help to seal off the agreement. Even the professional lawyers can make an effective use of the current templates. The users can be highly benefitted by the super responsive features of the templates. The templates have been so created that the user can upload information with a lot of ease and speed. 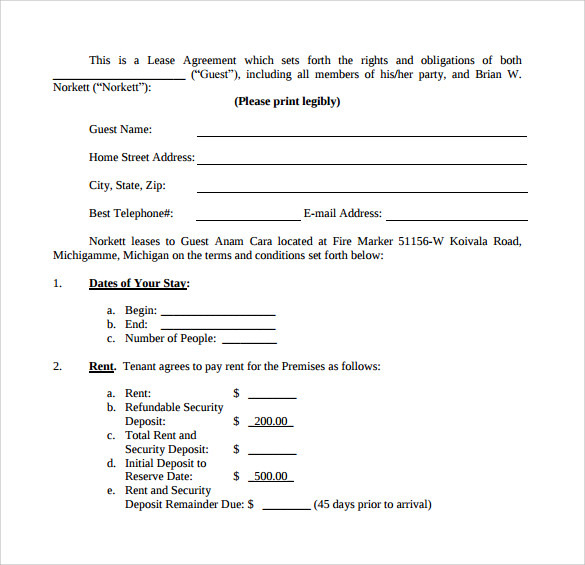 Most of the templates have been provided with blank spaces that can hold information of the agreement. In this way the user can make very effective documents that shall be informative in matter of minutes. The templates can also help the user to get very good quality finished products. This is why the users shall get final document that can look very impressive, important and also highly authentic. Most of the templates have been created by professionals. Hence the internal formats happen to be very much relevant. At the same time we see that they require minimum changes which can help the user to save a huge amount of time. The users can invest their saved time in other more important as crucial tasks. The templates are SEO compatible that means that they can be attained with ease from the internet pages with supreme ease and speed by anybody. The user shall need to give very simple internet search criteria. The vacation rental agreement templates are designs that can help the user to make very impressive rental agreements; the topics and the concepts of the designs are very much specific and can also allow the users to create documents that shall be highly organized.